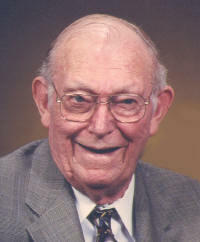 Henry H. “Hank” Holtgrave 82 of Breese died Sunday October 9, 2005 at Caring First Nursing Home in Breese. He was born June 27, 1923 in St. Rose, IL to Louis and Mary (Liening) Holtgrave: they preceded him in death. Also preceded in death by his Father and mother–in-law Stix and Lilly Ann Moss, sisters-in-law Georgian Kreke and Jeanette Holtgrave. He married Mary Ann Moss, May 11, 1948 at St. Dominic Church in Breese and she survives in Breese. Also surviving are sons David (Dannie) Holtgrave of O’Fallon. Marvin (Joan) Holtgrave of Highland. 5 grandchildren Shannon and Shaun Holtgrave, Wes and Brent Hampsch, Cassie Volker. 2 great grandchildren Morgan and Kelsey Holtgrave. Step mother Elsie Holtgrave of St. Rose. Brothers Donald Holtgrave of Germantown, Dennis (Phyllis) Holtgrave of Belleville. A sister Dolores Holtgrave of Breese. Hank was retired from Scott Air Force Base, A veteran of WWII where he received the purple heart. Member of St. Dominic Church and Men’s Sodality in Breese, Breese American Legion Post 252, Trenton VFW Post 7983 and D.A.V. of Trenton. Funeral Mass Wednesday October 12, 2005 at 10 am at St. Dominic Church, Breese with Fr. Patrick Peter and Fr. Pat Jakel officiating. Interment St. Dominic St. Augustine Cemetery. Visitation will be Tuesday October 11 from 4 to 9 Pm and Wednesday Oct. 12 from 8 to 9:45 am at the Moss Funeral Home in Breese. Breese American Legion and Trenton VFW will hold services at 7:30 PM on Tuesday at the funeral home. Memorials can be made to Wishes of the Family and will be received a the funeral home.